← Does Archaeology Support the Bible? The first war recorded in Scripture—between five southern kings and four eastern kings—is found in Genesis 14:1-14. You may read Genesis 14 here: Bible Gateway. Verses 1-14 not only serve as an introduction, but also relay the political and geographical climate of this large territory in Abram’s day. 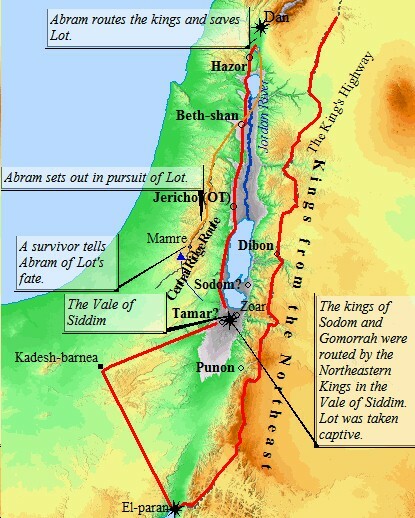 This area stretches north and west of the Sea of Galilee, and winds south through the Jordan Valley to the Red Sea. This prime land bridge between Egypt and Mesopotamia would seal a monopoly on international trade for the king in control. Shinar, (Babylon, modern day Iraq) launches this war after being subdued for 12 years—along with the other southern kings—to Kedorlaomer. Thinking that the tar pits in the valley of Siddim will be a natural defense, Sodom and Gomorrah kings, along with their southern allies, prepare for battle. But instead, they meet defeat. Lot and his family—who separated from Abram and moved to prosperous Sodom—find themselves trapped in a nightmare as they are taken captive by the eastern kings. Although Abram could have left Lot and his family to the consequences of their new move, he didn’t. Abram and 318 of his trained men march a great distance—240 miles one way—in pursuit of the enemy. Their tough trek begins in the hill country south of Jerusalem to Dan, (the most northern region that came to be called Israel). As the enemy revels in their victory at night, Abram divides his men and launches a counter attack. They successfully rescue Lot’s family and all his possessions. Melchizedek, “king of Salem and priest of God Most High” (vs. 18), tributes Abram’s success to God as he blesses Abram. In response, Abram recognizes his priestly role and gives him a tithe. He was a respected king of that region. Abram was simply showing him the respect he deserved. The name Melchizedek may have been a standing title for all the kings of Salem. Melchizedek was a type of Christ [illustrating a lesson about Christ] (Hebrews 7:3). Melchizedek was the appearance on earth of the pre-incarnate Christ in temporary bodily form. Prosperity can be enticing. But like Lot, we can easily become enslaved if our aims don’t line up with God’s agenda. What trial(s) are you going through? The trouble we face today is training us to be stronger for the more difficult tasks of tomorrow. Like Abram, we should: Prepare for difficult tasks; seek courage from God; and be willing to act immediately when others need our help. This entry was tagged Bible Study: Abram Rescues Lot - Genesis 14, Christianity, five southern kings and four eastern kings make up the first war recorded in Scripture near the Jordan Valley, how far did Abram trek to rescue Lot?, how many men did Abram have to help rescue Lot?, Lot was taken captive by the northern kings, the kings of Sodom and Gomorrah were routed by the Northeaster kings in the Vale of Siddim, What does the "King of Salem" mean?, what does the name "Melchizedek" mean?, what was The first war recorded in Scripture, what was the political and geographical climate in Abraham's time?, who is Melchizedek?, why didn't Abram accept Sodom and Gomorrah's kings' gifts?, why does God allow trials?, why would a king want to control the land bridge between Egypt and Mesopotamia in Abram's day?. Bookmark the permalink.